***Click the "preview" option for a closer look! The Elementary Girls Clip Art set includes 4 high resolution, 8.5"X11", 300 DPI .jpeg images (perfect for crisp, blur-free printing!). Each file has a transparent background for easy placement. 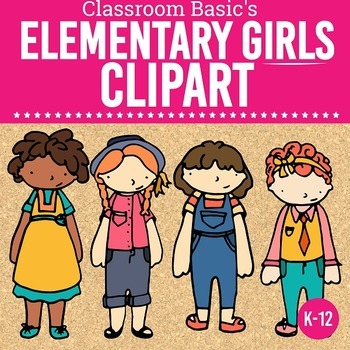 You may use the Elementary Girls Clip Art set for commercial use, within a document for sale on TPT, provided you abide by the rules in the Digital Content License and credit Classroom Basics. Click on the preview to view the instructions for use (these are included in the final download as well). The Elementary Girls Clip Art graphics are meant to decorate your classroom or enhance your products. These are not intended to be redistributed, for free or for sale, as images, design resources, or clipart. Note: This product contains 4 individual images packaged in the form of a .zip file. If you are not familiar with a .zip file, please click here. If you are still having issues please feel free to contact me, or TPT support. Thank you.